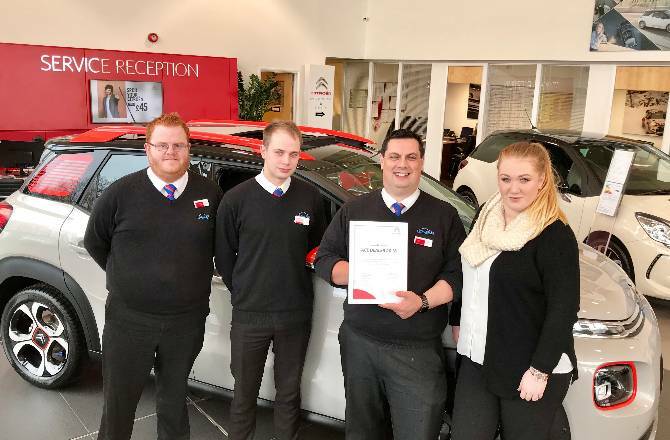 Citroën UK recognised Howards Citroen, based in Taunton, as passing the ‘ACE Accreditation’ Foundation Phase in light of improvements made to their Aftersales division. To achieve the accreditation, the Howards Citroen management team worked alongside Aftersales experts from Citroën UK. This was on a nine-month consultancy, coaching and training programme, to maximise key opportunities within their service department based on Priorswood Road. The programme covered everything from customer parking and onsite facilities, such as Wi-Fi availability and refreshments, as well as working in detail with the service team to optimise the standard of their reception and workshop processes. The aim being to ensure customers receive the best possible experience and value for money when visiting the Citroën dealership. ACE Accreditation is a UK initiative that Citroën UK started in 2015. Driven by an international programme from the PSA Group, this initiative from Citroën UK ensures a high standard of Aftersales services are delivered to customers via their entire network of dealers.